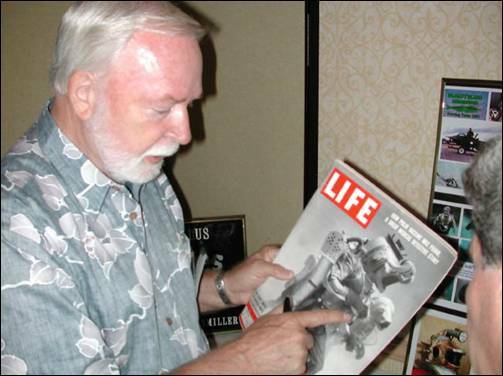 Bill Stropahl discusses a photo of himself on the 1954 LIFE MAGAZINE cover, with Paul Brooks in Anaheim California, 2003. 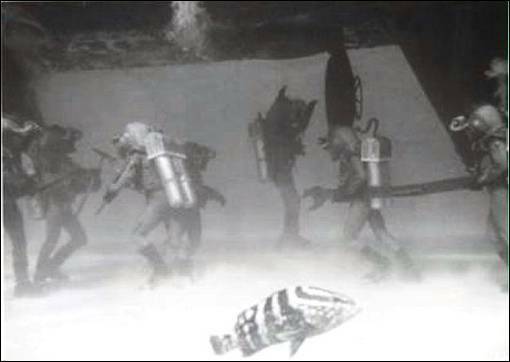 Disney Stunt Divers descending from the support vessel, and walking on the seabed at Lyford Cay, New Providence Island, Bahamas, 1954. Bill Stropahl was born in Wisconsin in 1929. His family came through the depression and moved to Chicago. He recalls being a good reader in school, and was always interested in sports. He showed a talent for pole vaulting in High School, and wanted to try out for that; but times were tough, and work always came first. He’s a man who’s had to work hard all his life. Bill worked for Captain John for a while in Texas, but he was always looking for more work. 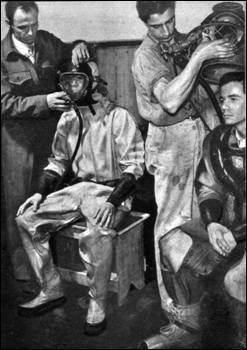 Some of the available underwater jobs involved burning and welding, which he’d done on dry land but not underwater. So he moved to California looking for training and more work. That’s where Bill met and began working with the famous diver Ellis Royal (E.R.) Cross. 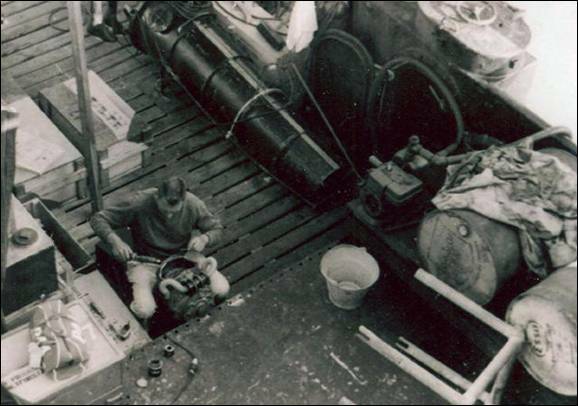 Bill spent time working on various jobs and lived in a hotel in Wilmington, California (near San Pedro) while attending training at Cross’ Sparling School of Deep Sea Diving. 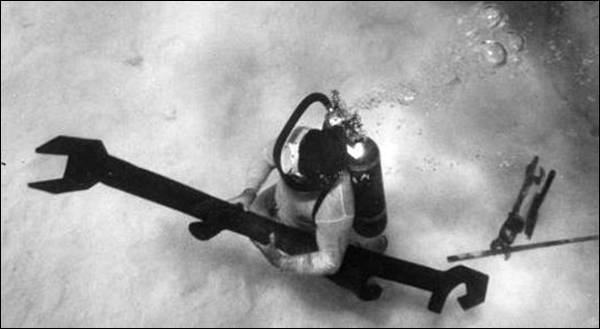 There, he learned and developed his underwater burning and welding skills, and then went to work doing that commercially; oftentimes working jobs with Cross. 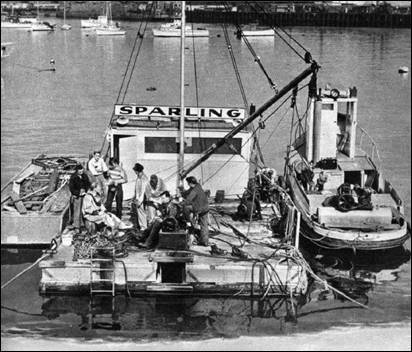 The picture above left shows the training barge for the Sparling School of Diving: anchored in murky water so trainees could become accustomed to working in low visibility. 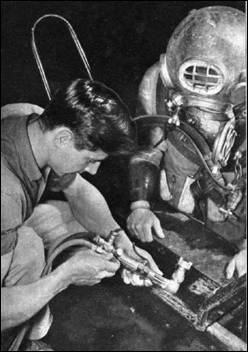 In the middle, a student diver at the Sparling School receives instruction in operating an underwater cutting torch, as Bill did. 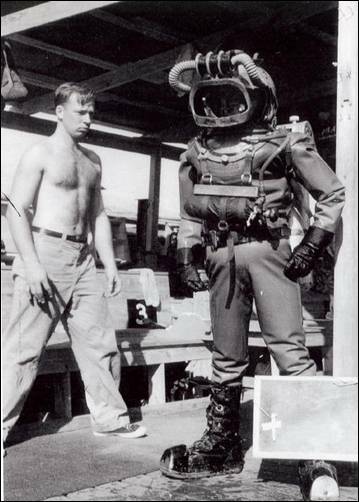 On the right, we see the two types of diving dress available at that time: a light weight drysuit (if not custom made, then possibly Pirelli or ScubaTotes) with a Jack Browne mask for shallow water use; and the traditional heavyweight MkV diving suit for deep sea operations. 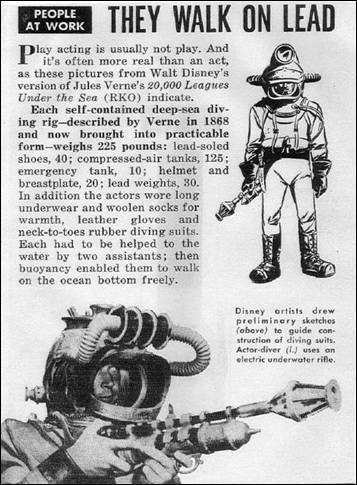 Eventually, Disney would combine parts of both rigs with SCUBA to produce the Disney Diving suits. 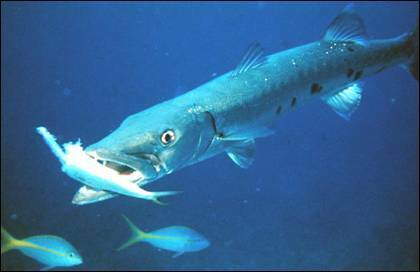 But as can be seen here, most of the essential elements were already in use and available to Bill at the Sparling School of Diving. 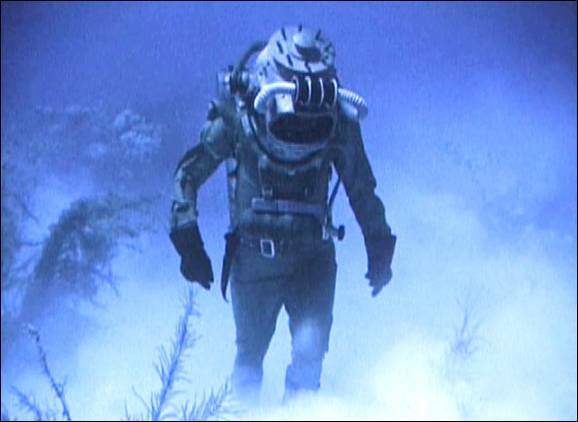 I asked Bill if he saw any of the 20,000 Leagues diving gear there at the time, and he replied, “When I walked in there was a pair of hightop boots there that I looked at and thought, ‘Hey! 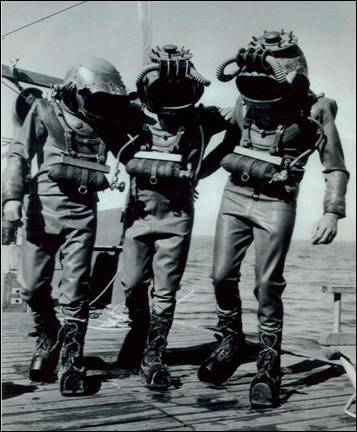 Those are kind of neat.’ I wondered what the story was on them, but other than that, I didn’t see any of the helmets or suits at that time.” That would come later: aboard the Disney Dive Barge in the Bahamas. 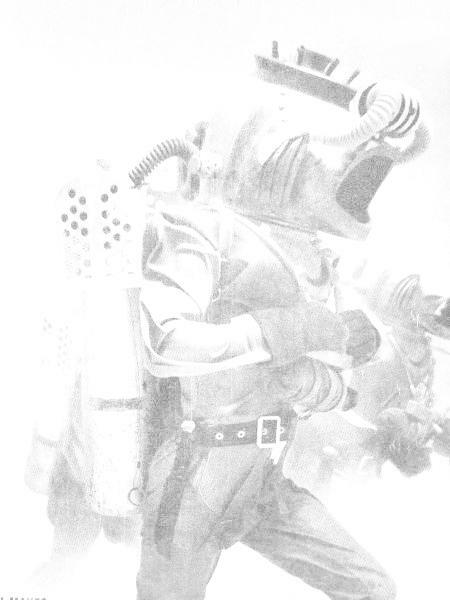 The basic concepts of the Disney 20,000 Leagues diving suits were developed in the latter half of 1952; and the pre-production work had taken most all of 1953. 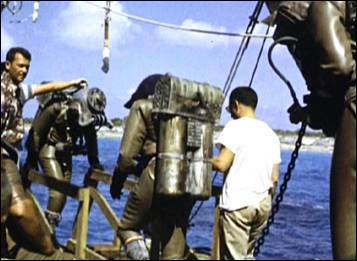 The 212 shipping crates containing all the diving gear arrived in the Bahamas on New Years Day, 1954; and shooting of the underwater sequences began on January 11th, at Lyford Cay on the West end of the island of New Providence. Here’s how Bill recalls those days. 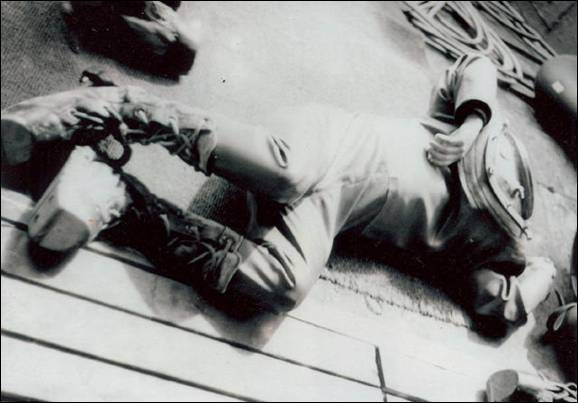 During the first weeks, filming was delayed by the weather, and by a number of technical problems. 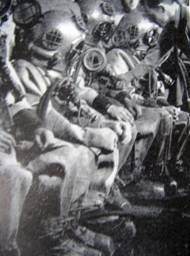 Under the right conditions, the divers did as many as four dives per day, assembling the underwater scenes for Leagues in piecemeal fashion. When off duty, they lived in a hotel and enjoyed a lifestyle which included lobsters and beer, courtesy of Disney. But there was trouble brewing in paradise. “Roy Disney was the one who took care of the money and things were getting tight. We did not know it at the time, but at the same time we were making this movie they were trying to build Disneyland. Pretty soon the lobsters and beer left our menus. 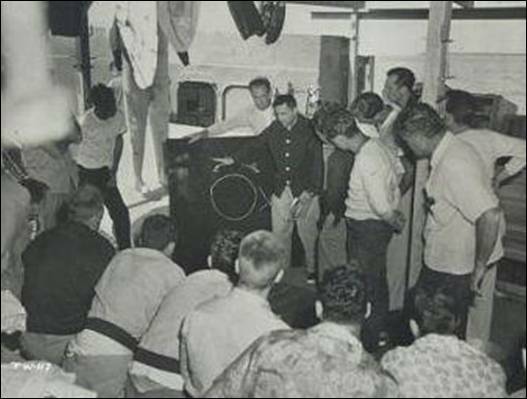 Then we commercial divers were asked to a meeting of the divers at the hotel, not attended by Zendar or Hansen, probably because they were like Management. 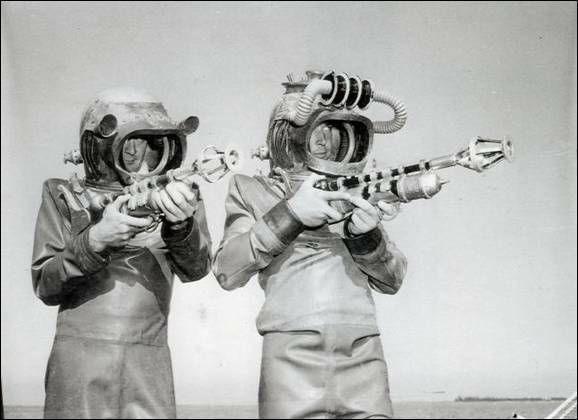 “These Scuba or Hollywood divers were complaining that they didn’t like the Disney Diving equipment. Their spokesman said they were thinking about going on strike for more money because they thought the suits were dangerous, too heavy, etc. 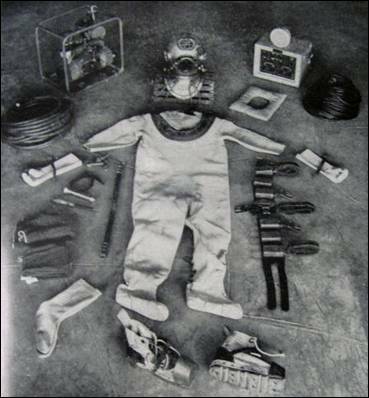 “A few of us who had experience with lead shoes and helmets said we didn’t have any problems with the suits. Our group said that we didn’t know how they worked in Hollywood but if they decided to strike we would go along. “The spokesman left, then came back and said that the Disney Company wasn’t going to give us any more money, and they were going to check into hiring new divers. There was silence in the room. I asked them to give me a moment and I might be able to find out if what they said was true. 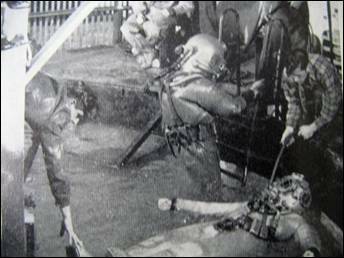 Speaking candidly of the diver strike in more recent times, Bill said, “When I was being interviewed for the documentary, I asked the Disney people if they wanted to use that story. It was decided to leave that out. The strike was something Disney probably wouldn’t want to publicize.” But Bill feels it’s a part of Leagues history that should be known, and has allowed us to disclose it here at VSC. 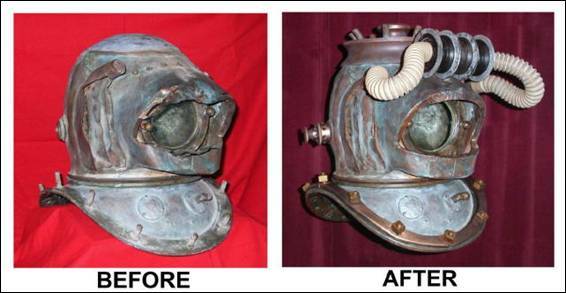 Since the authentic Disney helmet I recently restored was found damaged in an Imagineering warehouse, Bill was one of those I asked for information about how it got that way. I had reason to believe the damage might have happened during filming. Bill couldn’t shed any light on the subject, however. And because nobody else could say for sure how it occurred, the damage was deemed historically insignificant, and I proceeded with the restoration. “Another time, we were working with three turtles. Those things were strong. Needed a couple guys to control each one. There was this underwater cameraman kneeling in the sand with a big boxlike underwater camera, and we were supposed to bring the turtle towards him. One of us hanging onto each set of flippers. We were supposed to bring the turtle’s beak straight toward the camera lens, and then at the last minute raise him over the camera and keep going. Back in the day, one of the first articles on the making of 20,000 Leagues appeared in the February 1954 issue of LIFE MAGAZINE. 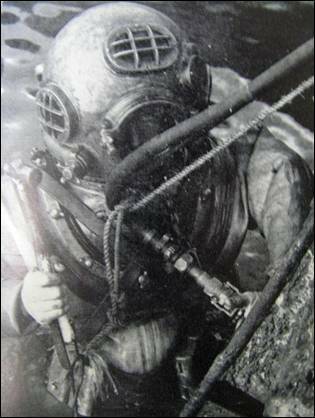 The diver featured on the cover is Bill Stropahl. Here are some color photos taken at the same time that didn’t make it into the magazine. Above left, is the magazine cover itself. 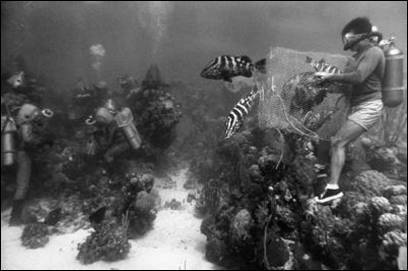 In the center, we see a Diver dropping into the area before the photography began. 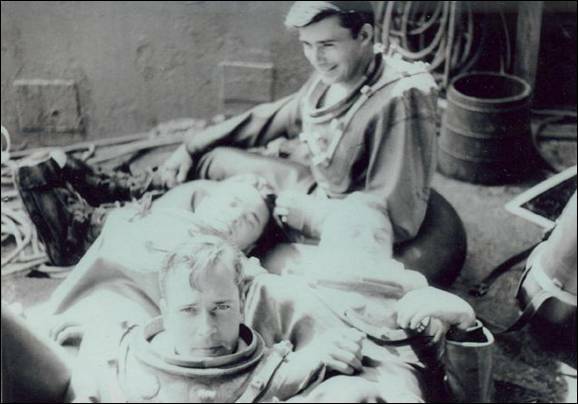 And on the right are two of the divers in the “Baldy” helmets kneeling on the seabed as they wait for directions. 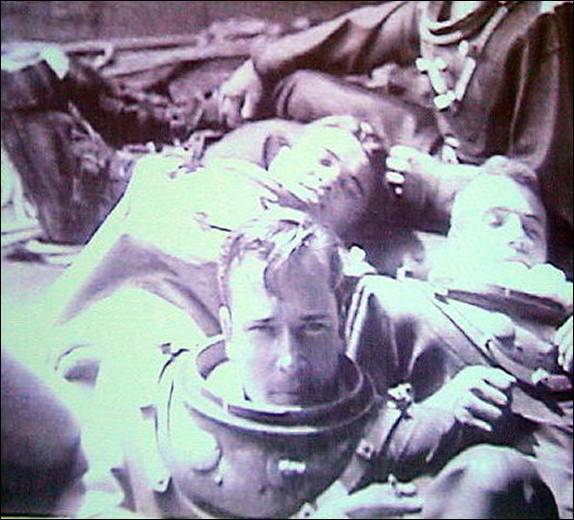 The diver in the center of that picture is wearing the Baldy helmet with the bent-down “horn” visible on the LIFE cover. 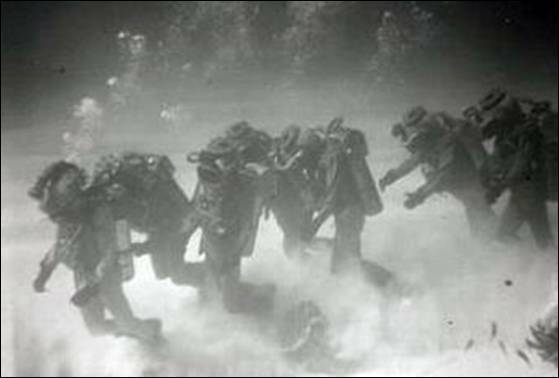 And here are three more views of the divers standing around, waiting to march off toward that moment captured on the cover of LIFE. 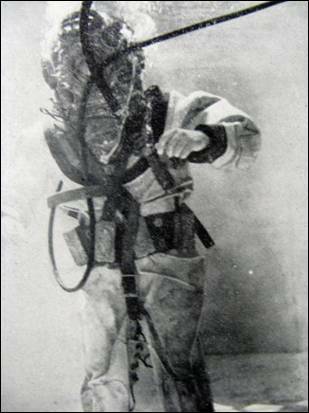 As you can see: a common pose has the divers hands on the pony bottle carrier bag straps. This is done to help adjust the position of the gear, and to relieve some of the weight of the breastplate pressing down on the shoulders. 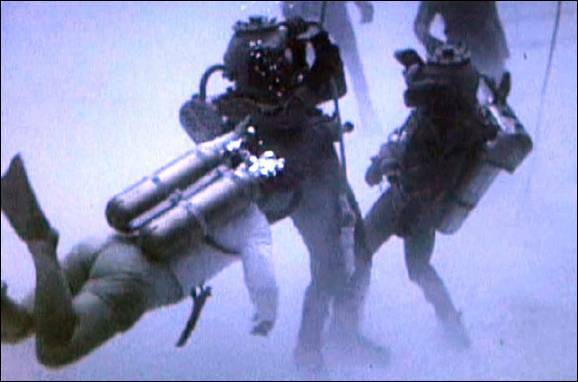 After the underwater filming for 20,000 Leagues was finished, the Disney Divers went on with their lives. When the movie made its debut in 1954, they had the pleasure of seeing their work immortalized on the silver screen. 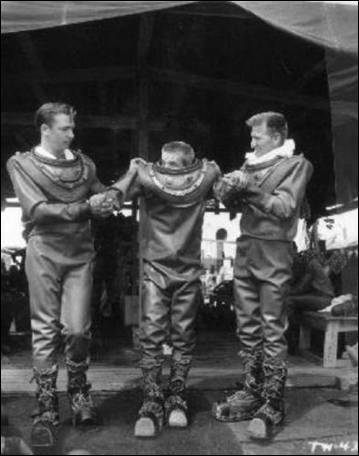 They might not have realized it at the time, but the Disney Divers became an inspiration to countless people (myself included) who went on to become SCUBA divers largely because of what we saw them do. (And of course, without them I never would have developed or produced the replica diving gear seen here at Vulcania Submarine.) We all owe them a great debt of gratitude. 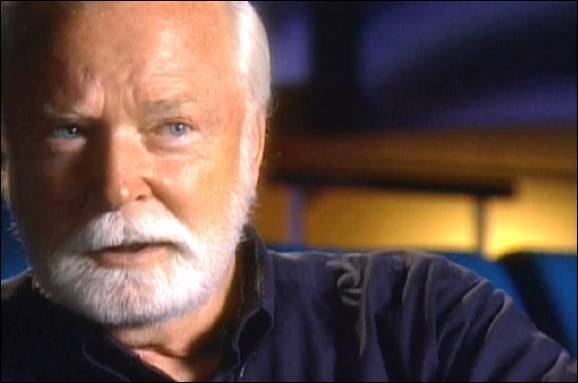 In 2003, Bill was honored at the 20,000 Leagues Expo in Anaheim, California. 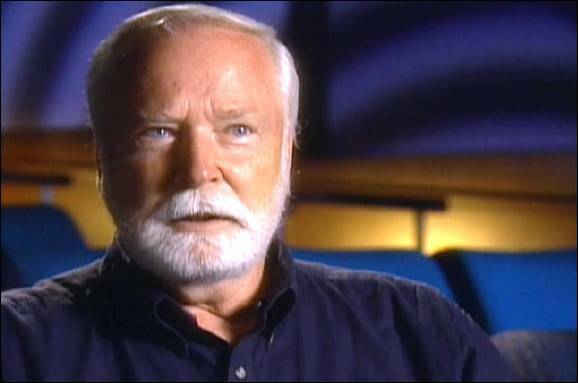 He was also featured in the 2003 Disney documentary, The Making of 20,000 Leagues Under the Sea. Here at VSC, we’ve done our best to document the achievements of the Disney Divers on our page dedicated to them. And now, we offer this page in honor of Bill Stropahl. Today, Bill and his lovely wife Gale have a beautiful home in Southern California, where they are enjoying their golden years with their family. I consider myself tremendously fortunate to have had the privilege of getting to know them, and being allowed to tell Bill’s story here at VSC. NEW! Here are more pictures, from Bill’s personal collection for display at VSC. Here’s the same pic shown above as a slide projected at the 20K Expo in Anaheim, 2003. I know these guys were diving up to four times a day for the cameras; and I know how laborious and time consuming it is to get in and out of one of these suits. So I can understand why they sometimes kept their gear on between dives. 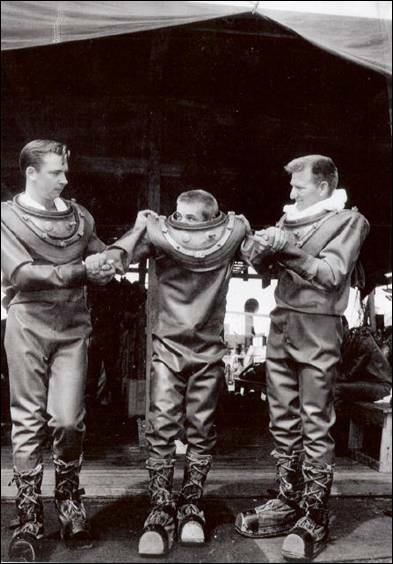 But I also know how hot it gets wearing one of these rubber drysuits out of the water. Really have to admire the dedication and fortitude of the Disney Divers. That’s Bill on the right, posing for the camera with the electric rifle. Pictures like this were sometimes used for press releases. And speaking of which: here’s magazine article describing the Disney diving apparatus, which used a cutout of Bills rifle photo. 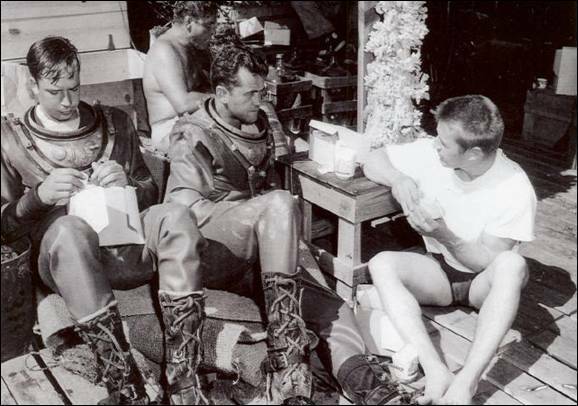 Bill (on the left) engaged in a little downtime horseplay with Canadian Diver Leonard Mott, center. I have this picture posted above; but this is Bill’s copy, so the clarity is better. It’s the Headless Diver!!! No, that’s Leonard Mott kicking back between dives. Bill recalls Len as the sparkplug of the Disney Diver team: always had something good to say; was always trying to help someone. Len was a real fun guy to be around, as this picture shows. Tragically, Leonard Mott lost his life trying to save another when the Second Narrows Bridge collapsed at Vancouver, Canada, in 1958. Len was a true hero, and we’ll be doing a tribute page for him here at VSC in the near future. Lunchtime! Bill on the left; Len Mott on the right. 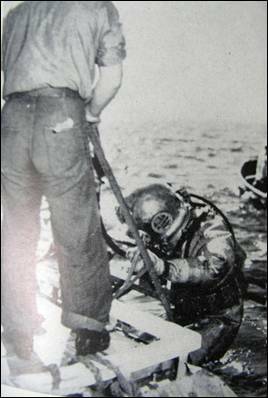 Bill on the right, helping a diver out of water. See the number “3” on the crown knob? Bill says the helmets were numbered at first to correspond with their position on the outfitting benches. 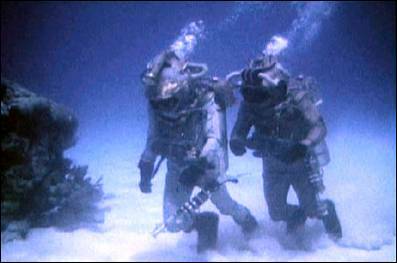 After a while, when the divers became more familiar with what went where, those numbers were removed and they aren’t seen in any footage that made it into the movie; so it’s likely this picture was taken in the first week or so on location in the Bahamas. 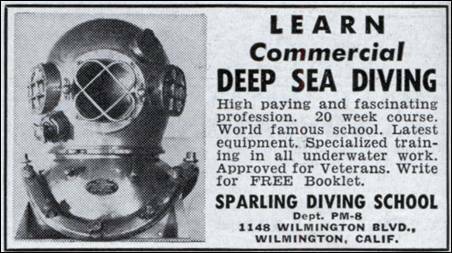 Bill told me the picture above shows one of the SCUBA divers who wanted to see what a Leagues rig was like, so they suited him up in a Crowntop. The fellow quickly realized just how heavy this equipment is out of the water. That’s Bill standing by to catch the diver if he falls, though he confided in me that "if the fellow was really on his way over and down there wouldn’t be much that Stropahl kid could have done to keep the poor guy from hitting the deck. Those rigs were heavy!" Another candid shot with Bill on the right. 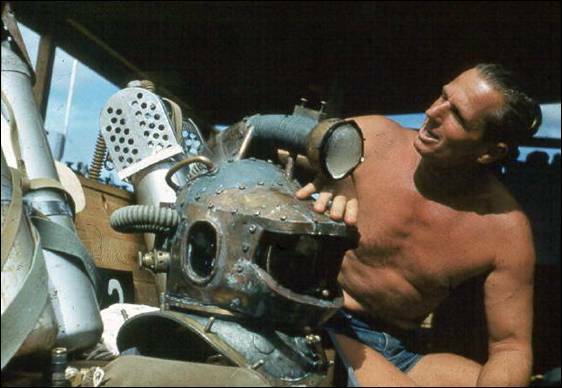 Here’s one of the prop men making repairs to a Crowntop Crew Diver helmet. 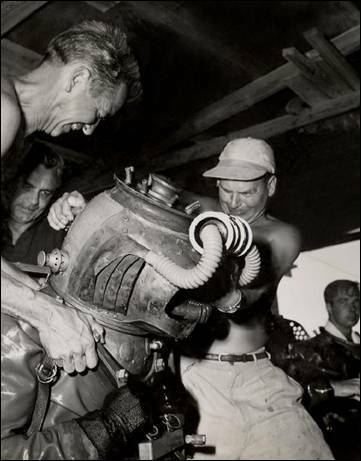 According to Bill, they had several guys constantly doing this duty: repairing bent gill fins and face masks, replacing broken “air filter” spools, and so on. 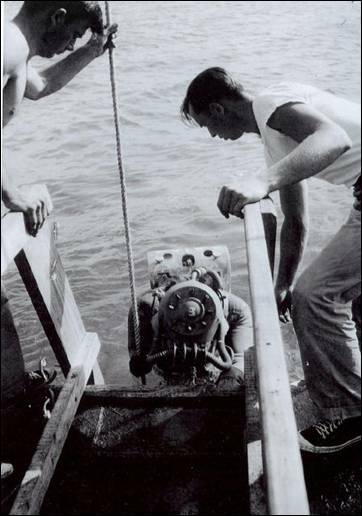 As a side note: the black cylindrical object is a compression chamber that was available in case one of the divers got the bends: not very likely considering the depths and dive times involved, but still a possibility that the Disney crew made sure they were prepared for. Great stuff, Bill! Many thanks! UPDATE NOVEMBER 2016: Just got off the phone with Bill; he is doing well, working on his landscaping and enjoying life. I wished him a Happy 87th Birthday and wished him many happy returns of the day. 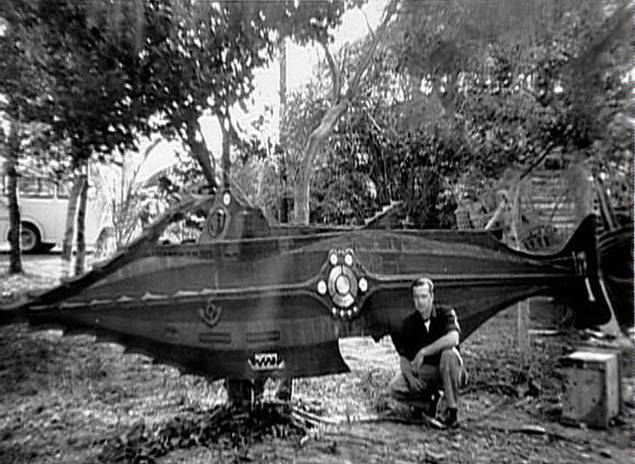 As we spoke, Bill mentioned a picture of him and the 2-dimensional Nautilus prop that was made for the movie but is not seen onscreen. 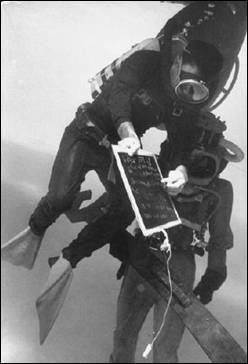 I thought I had posted that picture on this page but now I see it was on the first Disney Diver tribute page I made. So I just sent him a copy of it by email and now I will post it here. Enjoy! 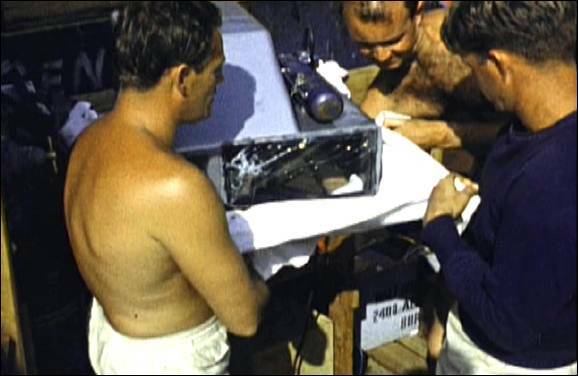 Disney’s 20,000 Leagues Under the Sea (1954) and Disney’s The Making of 20,000 Leagues Under the Sea (2003); Bill Stropahl; Wayne Orlicki; Pat Regan.